Today we (Gail Crowther, David Fitzwilliam, and I) visited Heptonstall to see the gravesite of Sylvia Plath. It was during a snowstorm; the winds were vicious and snow was blowing and drifting everywhere; it had to be seen to be believed, which is why I took some video. The village of Heptonstall was quite and we were the first to traipse to the grave. After visiting the grave, we walked up through the village and into Heptonstall Slack to see the Beacon, where the house was exposed to the full force and fury of the storm. The road at the bottom of the images (and video) was impassable from the snow drifts. Retiring after this exertion for a coffee at the Cross Inn was well earned to warm up before facing the rest of the day. This was my fourth visit to see Plath's grave and the first since 2003, which was in February of that year but at that time the weather was crisp and fine. Today's weather made for quite a surreal experience in what has been an truly magical, mysterious, and adventurous Plath-filled week with previous stops in London and in several Devon locations, which included seeing Plath book author's Andrew Wilson and Robin Peel, as well as a much loved meeting with Elizabeth Sigmund in which I got to chat-Plath and see Plath's copy of the Collected Poems Dylan Thomas. I wanted to see Plath's grave especially in this year as it is the 50th anniversary of her death. The landscape of Yorkshire in 1963 might have looked similar to what I saw today as that was the year of "The Big Freeze" when much of the country was under snow and ice. Here are some pictures of the grave of Sylvia Plath, the Beacon, and Heptonstall. In addition to these images, I have also posted two videos on Sylvia Plath Info Blog's YouTube channel. Click here to see Plath's grave. Click here to see the Beacon. Yesterday's preview of "These Ghostly Archives 5: Reanimating the Past" was very fun to do. A very big thank you to Plymouth University and to Rachel Christofid​es, Robin Peel, and Kathryn Gray for hosting us and coordinating the event, and to all of those who attended, including - & I only know a few people's names - Elizabeth and William Sigmund, Andrew Wilson, Marcus, Nick Smart, and Rosemary Clark. There was a lively question and answer session after a drinks reception and no doubt the wine helped with that! Gail and I had to massively cut down our paper for the talk, but the full contents will appear this summer in Plath Profiles 6, though the summer seems quite far off with the wind and rainy howling outside. The advantage to the talk was that we could quote from the letters Sylvia Plath and Ted Hughes wrote, as well as show images of the manuscripts we discuss, too. Please know that with rare exception, you can request and order photocopies or scans of anything we talk about it you are so inspired to do so. Words, as Plath wrote are like axes. The echoes of their strokes can travel "off from the centre like horses". And there are so many echoes in Plath's poetry – echoes of her life, the people she knew, her loves and her hates; echoes of mythology, folk–tales and magic – that her poems can mean many different things to many different people. Perhaps she did use the Tarot in Ariel, perhaps not. Whatever one believes about that, Plath's Ariel poems are remarkable poems written, as Ted Hughes said, "with the full power and music of her extraordinary nature". Ariel, as he also said, "is not easy poetry to criticize. It is not much like any other poetry". But "It is her… It is just like her – but permanent". Sylvia Plath slept here in 1962. Where is here? When in 1962? Find out either Wednesday at Plymouth University or in Plath Profiles 6 this summer in "These Ghostly Archives 5: Reanimating the Past" by Gail Crowther and this blogs owner. 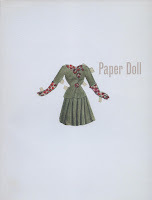 The Paper Doll catalog (ISBN: 0-88828-217-6) accompanying the exhibit by the same title is a well put together book. The exhibit appeared at the Owens Art Gallery from 16 September to 6 November 2011, and at the Mendel Art Gallery from 30 March to 10 June 2012. Both in Canada. Normally I like to be more timely with reviews like this, but found this buried in my list of documents. Sorry! 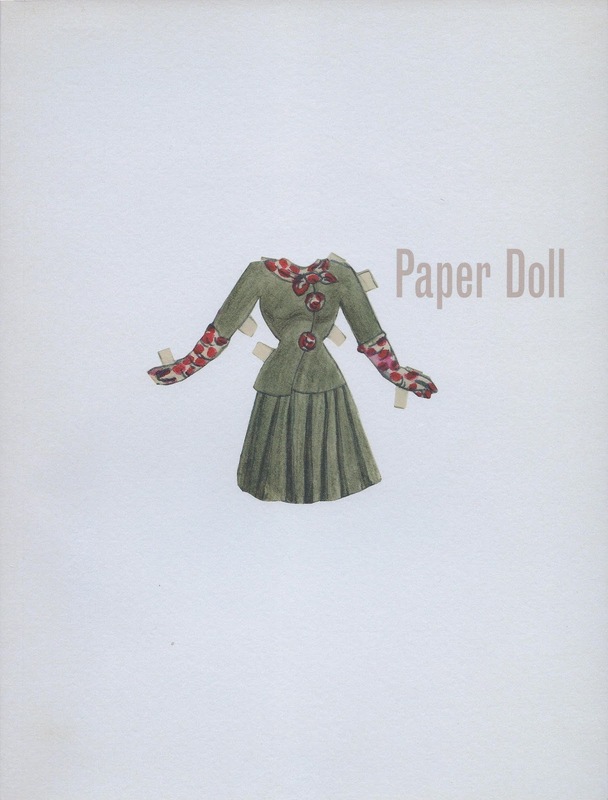 The cover image (pictured left) features a single paper doll outfit by Sylvia Plath from circa 1945-1946. Inside the book are three gorgeous full-page illustrations of Plath's paper dolls from the Sylvia Plath mss. II collection at the Lilly Library, Indiana University at Bloomington, as well as a roughly two page review of the Plath component to the exhibit. Curated and written by Anne Koval, the Plath piece is really well done; I cannot profess to possess any knowledge of paper dolls, so will spare everyone reading this any further critique. I like that Koval quotes from Plath's poem "Tulips" in regard to its reference to a paper doll: "And I see myself, flat, ridiculous, a cut-paper shadow." In some ways it reminds us that Plath, at age 28 when the poem was written, was not too far removed from the girl who made and played with paper dolls. (Koval appears to have missed that just over a year after writing "Tulips," that Plath began her poem "Crossing the Water" this way: "Black lake, black boat, two black, cut-paper people." Plath alludes to papery people also in her poems "Widow" and "The Applicant", among others.) And, it is wonderful that Koval makes connections between one of the paper doll designs Plath called "The Fairy Scarf" to a poem by the same name she composed in 1945. In addition to a copy of "The Fairy Scarf" that is held by the Lilly Library (Plath mss. II, Box 8, Folder 6), a fair, illustrated manuscript copy is held by The Morgan Library. Koval points out that Plath named her outfits with "romantic titles such as "Heartaches," "Fireside reveries," or "Easter suit" (14). But here was a missed inter-textual connection, for Plath wrote a poem called "Fireside Reveries" which was published in her junior high school newspaper, The Phillipian, in February 1947 ("Fireside Reveries" is not listed in Plath's Collected Poems). So it is quite contemporary to the eponymous paper doll outfit. The speaker in the poem, written in an irregular but rhyming meter, sits dreaming in front of a fire with "A book of poems in my lap" (Phillipian 7). She describes the way the flames leap from the logs in language and imagery that also call to mind the much later poems "Lady Lazarus" and "Fever 103°." I should think that any Plath reader, scholar, or enthusiast will likely enjoy this tall, slim volume as a rich component and addition to their collection. In my own experience with the Lilly Library, I can say that their digitization is top-notch. The digital surrogates of Plath's paper dolls in the catalog are amazing and crisp and take on a life of their own. Sylvia Plath's "Ghostly Archives" in one week! In 7 days - one week - Gail Crowther and I will give our much anticipated (ha ha) talk on Sylvia Plath and archives in "These Ghostly Archives 5: Reanimating the Past" at Plymouth University. Can you stand it? Are you going to be there? Thank you in advance if you are! Can you not make it? No worries, read it in Plath Profiles 6 to be published this summer. In a practice run through the paper last weekend via Skype, we discovered that it was more than 75 minutes so had to cut out entire sections! Whether or not you can make it, why not take the next few days to catch-up, familiarize, or re-familiarize yourself with the series of papers, published between 2009 and 2012. In "These Ghostly Archives 5: Reanimating the Past" we have something for everyone... previously unknown (or possibly never before cited) letters from Plath and Ted Hughes, never before seen photographs of the couple. And to boot, in the presentation we can quote from letters found and show images of these materials that we are unable to in our published paper. We look forward to reading this paper for you and to meeting some new people. Ted Hughes scholars are (even) welcome! Remember, the reading will be on 20 March 2013 in the Rolle Building, Plymouth University, Room 605, at 6 pm. *Image above may not have anything to do with talk and it used for illustrative purposes only. Though I am sure we mention Smith College's Sylvia Plath Collection & the Mortimer Rare Book Room at some point... How could we not? Filmmaker Melodie Bryant is working on a documentary film about The Barbizon Hotel for Women. She is offering kindly us access to a trailer for her film, which I am happy to pass along to you. One of the interviewees in the trailer is Janet "Betsy/Pollyanna Cowgirl" Wagner from Sylvia Plath's novel The Bell Jar. You can see more about the film at BarbizonMovie.com. P.S. 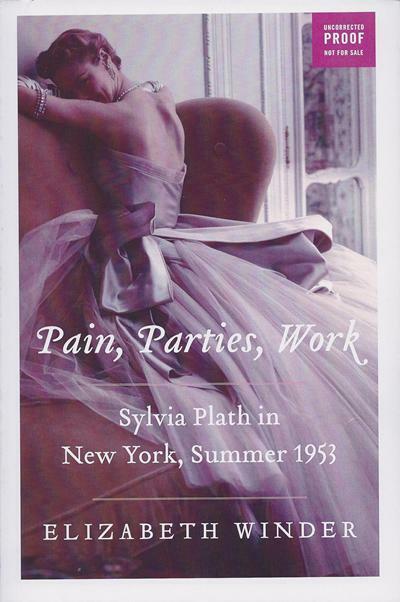 : You will learn and hear more from Janet Wagner and Plath's time at Mademoiselle in Elizabeth Winder's forthcoming book Pain, Parties, Work: Sylvia Plath in New York, Summer 1953, which is due to be published on 16 April 2013 by HarperCollins. Gail Crowther and I will give a preview of "These Ghostly Archives 5" at Plymouth University in two weeks, on 20 March 2013. The talk will take place in the Rolle Building, Room 605, at 6 PM. It will be followed (and likely preceded!) by a drinks reception. In "These Ghostly Archives 5: Reanimating the Past", Gail and I converse about recent archival finds including new Sylvia Plath and Ted Hughes correspondence and photographs. We cover a lot of ground, including documents from at least nine archives in three countries (Canada, the United Kingdom, and the United States). At least nine archives - seriously - I lost count! All five papers have all been written over email and this is the first time we will be speaking the text. We are excited and hope that you are as well. Advance notice of the talk appeared recently in the Plymouth Herald article "Previously unknown Sylvia Plath artifacts revealed in talk on the poet at Plymouth University". We would only like to add that Gail and I are intrigued by the name applied to us: "Sylvia Plath Scholars." Makes us feel like a rock band. Maybe we should sell t-shirts? Do not fret if you cannot make it, the paper will be in Plath Profiles 6 this summer. Submissions of your work on Sylvia Plath for Plath Profiles that are received after 1 April (that is, after 7:00:01 p.m. on 1 April) will be considered on a case-by-case basis but will more than likely be held out for the following volume. Deadlines are deadlines, after all. And for the love of Plath, please read and follow the submission guidelines. Perhaps I do not even need to post anything about it, especially so far in advance, but for some reason it seems necessary and/or appropriate. After Volume 6 of Plath Profiles goes live this summer, I will cease to be affiliated with the journal. It has been an honor to work with its contributors and correspond with its readers; however, after very long consideration I have decided this is the best course of action for me to take. I anticipate helping to promoting future issues to the extent that I can and wish Bill Buckley and the editorial board the best of luck going forward.